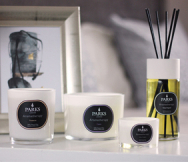 Our Parks’ Original (Lime & Citrus) with Bergamot and Vanilla Diffuser set combines our most famous scents with the rich, spicy notes of vanilla and French bergamot, and it is formulated for use with our rattan sticks. This allows you to fill your home, office or any other space with this luxurious scent without using an open flame – a scented candle without the candle! Our proprietary ‘Original’ citrus and vanilla scent combination is one of our favourites. The tart citrus tones lend a clear, pure feeling to the atmosphere, whilst vanilla brings with it the memories of baking, treats and ice cream in the warm summer sun. The whole is a relaxing, ‘homey’ fragrance that is an instant classic. Added to that is the essence of fine French Bergamot. This is another citrus tone, but one that is very different from the lemon and lime of our classic ‘citrus’ mix. Bergamot is the scent many of us associate with Earl Grey tea, and is a richer, spicier tone that balances the tartness of the other citrus tones wonderfully. Aromatherapists, who believe that bergamot has the ability to relieve depression, sadness and stress also love it. This set includes a full 250ml (9 ounces) of scent and a number of all-natural rattan sticks that are designed to usher the scents into the stir without either adding or subtracting anything. Everything in the kit, from the reeds to the essential oils and the diffusion matrix itself, is 100% pure natural and organic. Vol: 250ml / 9 fl. oz.